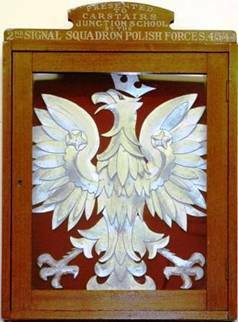 The crowned white eagle featured is the national emblem of Poland. The plaque to the school was located in the School library. The presentation was probably made on the departure of the Signals Squadron from Carstairs, just one day after the 3rd May - Polish Constitution Day. It is possible that the 2nd Signal Squadron moved into the school sometime in late 1943 as in the week ending 6th December 1943 a signal's course with No 2 (Armoured Division Artillery) Signals Squadron at Carstairs was started for NCOs and ORs of the 1st Polish Anti-Tank Regiment which was based near Lanark. The 2nd Signals Squadron formed part of the Armoured Divisional Signals of the 1st Polish Armoured Division commanded by General Maczek. Four other squadrons – HQ, 1st, 3rd and 10th made up the signals composition of the Division. At the beginning of May 1944 orders were received for the whole of the 1st Polish Armoured Division to move out of Scottish Command's area to Northern Command over the border in England. Such moves commenced circa mid May 1944 and would have included this signals squadron. The teachers, parents and pupils of Carstairs Junction Primary School (Coronation Street) are mindful of the school’s heritage, including its Polish connections and have made a short video about the school. Click on the link to see a short video (2’36’’). The Polish National emblem can be seen in the background in some of the scenes in the video. The school was succesful in obtaining a grant from the Heritage Lottery Fund to undertake a project. Their project will celebrate the heritage of Carstairs Junction Primary School which was built in 1902. The building has been used as a primary and secondary school as well as a Polish military training centre during World War II and is now due to be demolished. Click here to see photos of the old school (external link to Bebo) which would have been familiar to the Polish soldiers. In “Our School A History of Carstairs Junction Primary School – from the old to the new...” available in the form of a MS Word document (click on above link) to download and view the document.